Former President Chief Olusegun Obasanjo says that diabetes only kills those who are careless about its treatment. He said a diabetic patient can still live till 100, saying "I don’t know when I will die but I am above 80 and many youth could not catch up with my pace during the exercise this morning". 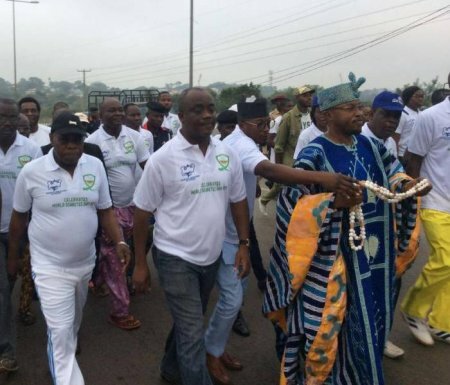 Mr. Obasanjo made the statement on Friday in Abeokuta when he led hundreds of people on a road walk to sensitise the populace on the disease and how to manage it. The road walk was organised by the South West Zone of the Diabetes Association of Nigeria (DAN) in collaboration with the Olusegun Obasanjo Presidential Library (OOPL), to mark the 2017 World Diabetes Day. The two kilometre walk which began at the OOPL, passed through MKO Abiola Way with 15 minutes stop-over at the premises of Sunny Yinka Oil before terminating at the take-off point. “Come and see me in the morning, you will know I am growing strong, even in the afternoon; you will know I am growing strong. He advised diabetics to be mindful of their health and eat healthy. “You can be diabetic and still live till 100. I don’t know when I will die but I am above 80 and many youth could not catch up with my pace during the exercise this morning. Many of them were running after me. “This is my message. Whether you’re diabetic or you have a family or friend who is diabetic; diabetes is not a killer disease or it should not be a killer disease unless you are careless,” Mr. Obasanjo added.